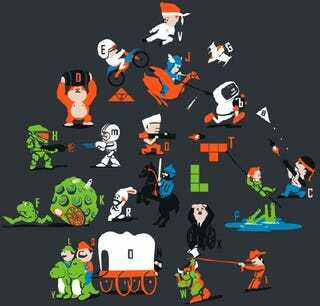 And to wrap things up today, here's "The ABCs of Gaming," from a t-shirt design contest at Shirt.woot.com. The contest closed this week. The latest on the site shows another shirt claiming 2nd place in this derby so, who knows, maybe it won. I'm sure the ordering information will follow. For now, take a long look and see if you can name all 26. I can name about 19 offhand. There's a spoiler solution after the jump.